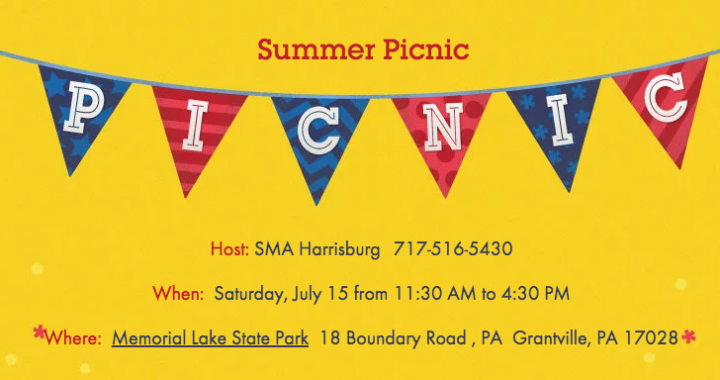 Susquehanna Malayalee Association cordially invites you and your family to the SMA Summer Picnic event on Saturday, July 15th from 11:30 AM to 4:30 PM. Members can look forward to a fun filled day with socialization and lot of games for kids and adults. FREE for Kids of age 10 and under. Member Admission Fee: $10.00/person for age above 10. Non-Member Admission Fee: First time participants will enjoy member rates. Others: $15.00/person for age above 10. Non-Members are encouraged to become members and enjoy the reduced rate and other benefits for all of SMA events. Membership may be obtained at the event registration counter. Annual membership/renewal amount is $25/Family and $15/Single. Check or cash will be accepted. For better planning, please respond to this invitation by July 9th. Disclaimer on Photos and Videos: Any photographs taken by the designated SMA volunteers will be shared among all SMA members via web based photo albums and videos taken by the SMA will be shared in YouTube. SMA will not be responsible for the distribution of photos and videos taken by any other attendees of the event.